Intel® Trace Analyzer and Collector is a graphical tool for understanding MPI application behavior, quickly finding bottlenecks, improving correctness, and achieving high performance for parallel cluster applications running on Intel® architecture. Improve weak and strong scaling for applications. A unique MPI Correctness Checker detects deadlocks, data corruption, and errors with MPI parameters, data types, buffers, communicators, point-to-point messages and collective operations. The Correctness Checker allows the user to scale to extremely large systems and detect errors even among a large number of processes. Intel® Trace Analyzer and Collector includes full-color customizable GUI with many drill-down view options. The analyzer is able to extremely rapidly unwind the call stack and use debug information to map instruction addresses to source code. With both command-line and GUI interfaces, the user can additionally set up batch runs or do interactive debugging. Low overhead allows random access to portions of a trace, making it suitable for analyzing large amounts of performance data. Thread safety allows you to trace multithreaded MPI applications for event-based tracing as well as non-MPI threaded applications. Low-intrusion instrumentation supports MPI applications with C, C++, or Fortran. 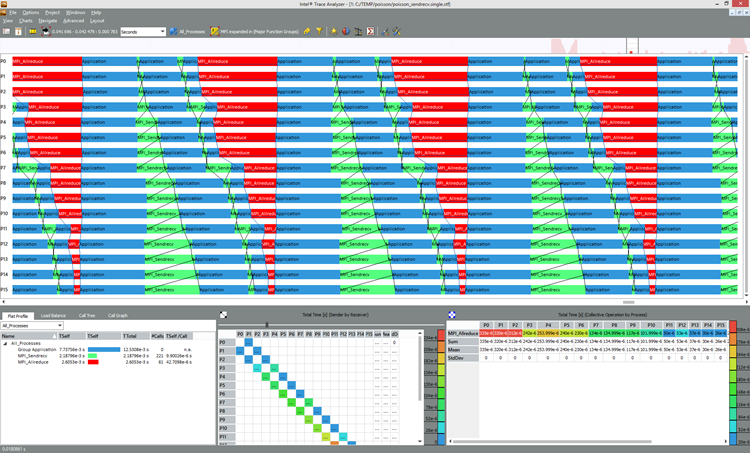 Intel® Trace Analyzer and Collector automatically records performance data from parallel threads in C, C++, or Fortran. Processor Support: Latest Intel® Xeon and Intel® Xeon Phi™ processors. Partitioned Global Access Space (PGAS) Support: Includes OpenSHEM* support. Development Environments Works with compilers from Microsoft, GNU Compiler Collection (GCC), Intel, and others that follow these standards. Operating Systems Intel Trace Analyzer and Collector is available on Linux* and Windows*. For macOS*, only the analysis feature is supported.